Club Penguin Cheats by Mimo777 Club Penguin Cheats by Mimo777: Happy Halloween from Mimo and Club Penguin Gang! Hope you get TONS of candy tonight! We will be posting something pretty cool tonight so check back once you get all your candy! 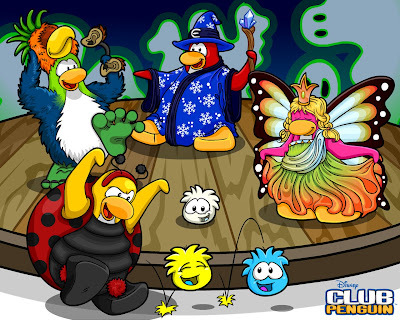 Click here to download this Club Penguin Wallpaper. WHAT ARE YOU DRESSING UP AS TONIGHT? IF YOU ARE FROM A COUNTRY THAT DOESN'T CELELBRATE HALLOWEEN TELL US! MIMO! you added me on tootsville! jack said we have to email him why we want the laptop then he will pick a winner! I'm being a gangsta! Or mofia if you prefer. Heyy, what are YOU being! i am a cool orange genie! i'm going to be a masquarade. I am going trick or treating in the USA. Im going as a pirate princess. Its more of a pirate than a princess cuz its pretty much a pirate but the colors are pretty much pink and black. I am dressing up as Mr.Monopoly. I have a cane. The back ground is soooo cool! The background is really cool! this is the coolest halloween party EVER! Im Being Haruhi Suzumiya from the anime "The Melancholy Of Haruhi Suzumiya"! man the halloween background is awesome! Halloween is one of my favorite holidays! im a boy so I WAS going to be an old lady and my cousin was going to be an old man but she didnt want to so now i am going to be a greek or roman or something like that. Im going to be a MUMMY! And my best friends r dressing up as a FLOWER,WIZARD,ALIEN & A BABIE. Im planning to get 200 peceis of candy. Wat r u beig for Halloween? Im going to be a bee, I made the costume my self! Im going to be a pirate tonight! mimo how many coins have u on cp i have 42019lol! im going as a dead fairy! i am being a gothic ballerina!! i even have a tutu!!! hi mimo! im going to be a bumble bee! i am going as the jigsaw killer from saw! I live in the Netherlands and there they don't celebrate halloween. IM going to be an awsome FACELESS thing! i ahve this mask where i can see YOU but u cant see ME!!! Im going as snake eyes from the new GI Joe movie he is so cool. im going to be Thing 1, my friends will be Thing 2, and my other friend will be the Cat in The Hat!! i'm from the philippines and we don't celebrate Halloween, Mimo!! i think i might win the laptop. im going to be a skeleton. hi i am aero master mimo,i am form Greece.My country is in europe and we rnt celebrate hallowen :'(. I already went Trick or Treating! Happy halloween CPG! Its around this time that ive known you guys for 2 TWO TOO TO Years! Youve helped me finding pins,free items ad lots of other things on club penguin and really cool other stuff! I just want to say thank you! Lets make Halloween our Anniversary for our friendship! Happy FriendShip Anniversary Club Penguin Gang! I'm going as a very batty girl. I have fangs, wings, sneakers, a dress, and stockings. Happy Halloween Mimo! Anwyay I got TONS of candy,lollys chocolate & everything! im dressin up as a black cat! my family actually was from a country that didnt celebrate halloween but i hav celebrated it since forever! p.s. i hope u get a lotta candy 2 :)! HI. i dont do hallowenn my mom wont let me i have never done it sigh. I'm going as Queen elizabeth the 1st because i descended from her! Australia does celebrate Halloween but quarter of the people dont give away candy! When you go to a house sometimes a sign will be on the door saying "GO AWAY NO CANDY" lolz! i hope everyone gets a lotta candy including u mimo! what r u gonna be?? my family is originally from a place that doesn't celebrate halloween.... wierd. anyways i hav always celebrated halloween since...forever. Ohh I also went as a bandit, I had a bandana around my face so it covered my chin and mouth,a black jumper and jeans and a beanie over my head! I'm going as the girl-Harry Potter! Because I'm like, a girl:P.
I'm dying to know what the surprise is! Im dressing up as a akatsuki member from naruto called Tobi!! Hi Mimo big fan. Lately i found a penguin dressed up as Santa. I saw a ton of penguins with him and every time he changed a room the room got full. Do you know him? I'm going to be a ghost and my friend is going to be a witch. - Sushi5463 and friend with no penguin name but she would like to be call rainbowted626 for her club penguin name! Wow thanks Mimo thats really nice and u rock. On other websites there are polls that say who is the best penguin of all time and i voted for you. I'm going to be the Phantom of the Opera. im alex from wizards of waverly place. im going as a ninja! i don't celebrate halloween. you americans are lucky. I'm gonna be a punk rocker! I have a Clash t-shirt and everything... except my electric guitar. I'm going to be a killer doctor ya kno with that torn up doctors coat with fake blood on it and all over my face I can't wait but this is my last year trick or' treating soo :( but anyways ByE! Keep on rocking Mimo! IDK what I am. My mom bought me a red and black cape, and a red and black mask.....sequins....I feel like an evil princess. I went LASTnight Because i live in NZ,Got heaps of candy,I was dracula. I'm gunna be a Sleestak from Land of the Lost! It's so funny looking! Well, Hope ya laugh but am going to dress up as a mustard bottle LOL. They were all out of ketchup! I'm going as a creepy rag doll...I'm so excited about CANDY!!! sob sob! I didnt have enough money to buy a costume! but I did let my dog bark at everyone who came trick or treating, but she didnt bite them, so they would come back next year and I would have fun again! ah ha ha ha ha ah ha ha ha... ha. so you can have fun even if you dont join in! im going to be Zorro. I went with my sis and cousin. The Girls dressed as witches! SPPPOOOKY! I GOT SCARED OF THEM! I WAS A FRANKENSTEIN! We all got Lots of CANDY!! YUM! I am a really awesome cowgirl! I'm going trick or treating with my 2 best friends! Mimo rocks! im going as a nerd... with a kick me sign taped on me back and everything!!! its awesome!! I am going as a penguin! Not a CP penguin, but a penguin! I'm going as Hermione Granger(from Hary Potter)! HAPPY HALLOWEEN!! IM BEING DORTHY FROM WIZARD OF OZ!! I'm dressing up as a Irish Girl! My street has soooo much candy every year, I'm going to gain 20 pounds in 1 night! Im a countess! what are you being? I am going to be a ghost. Hey Mimo, I'm from England and I already went Trick-Or-Treating. My friend fell over while we were going to different houses, and he dropped all his candy! :D LOL! I dressed up as a wizard and I got chased by a big gang of trick-or-treaters too. I got loads of candy though! I still haven't eaten it all, wanna help me? im being a "Cereal" killer. its a bunch of small cereal boxes glued to a plain shirt with knives and fake blood. it's so cool! I live in Australia and we dont do halloween. I am from Australia but me & some of my friends still eat heaps of lollies. I am going as a devil. Im going as a scientist that was working in his lab and working with a rat but something went wrong...HE TURNED INTO A MUTANT RAT! The mask my sisters said was REALLY scary. im gonna be darth vader! Hey Mimo. My name is Andreas and I am from Cyprus, an island in Europe. We don't celebrate Halloween, unfortunately!! Too BAD!! :( Happy Halloween to everyone who does celebrate it! I'm being the headless horseman!!!! i wish i was going to be ummm uh my penguin from cp! That rocks mimo i dressed up as a um myself. Have you read the commic strip "Pickles"? The little kid wants to dress up as God. It's pretty funny. Ya this will actually be the 2nd time I ever trick-or-treated. I did it last year and know I'm doing it again this year. I don't blame your mom though. Where I live there are quite a few bad things that go on. Well of course. Technically we all descended from everyone. But I get what you mean and that is very cool. I was going to do that but my parents decided that it probable wasn't a good idea to support the people who rig the super bowl. Wow an orange genie. Creative. Has anyone ever seen I dream of genie. It's a pretty old show. I'm A beat up skater. I am IRON MAN.Its kinda tight but still cool. IM GOING AS MAXWELL FROM SCRIBBLENAUTS! WOOT! I JUST CARVED MY PUMPKIN! I have 1 million coins. I cheated to get them though. Not with money maker. It was a glitch. Completely Club Penguins fault. Me too!! Which kind of outfit are you wearing? I'm wearing the outfit that came from the Smooth Criminal music video. i'm going as dorothy from the wizard of oz!! I cant wait to trick or treat!! Anyway, hope everyone gets a ton-o-candy!!!! Im gonna be Anakin Skywalker. I might use my red lightsaber! I am gonna be a mind or mime. Whatya gonna be for halloween??? I'm Mario! My littl brother is Luigi! We're having this HUGE Halloween party at our cul-de-sac! We even rented a bounce house! P.S. Mimo, cuz of the party, I can't mod tonight: I'm so BUSY! Sorry! Wow! I've never met someone going as Jesus! You seem like the interesting type. cool im dressing up as a um well i dont really know what im going to dress up as but as soon as i figure it out i will totally tell u!! u rock MIMO!!! Hi mimo! Im going to be a dragon for halloween. I wish i was a member for the suit on cp. THanks for the idea of checking the post after getting candy. I live in Australia & I got lotsa good candy! Anywayyys...what are YOU dressing up as for halloween??? Hahahahaha hey mimo!! guess what i just noticed!? in the UK (where i live) its 10.46pm, so everyone is out trick or treating or in the city for the parades, but in the US its still daytime and its too early to go out yet!! weird huh? anywayyz, i got loads of sweets and i went to the parade which was AMAZING!! We dont celebrate halloween here cause I am in australia!! How can u already go trick or treating?!? Halloween is today and its not even night yet! Hey Mimo i am going to be a witch. i dont celebrate haloween but i live in the USA my parents dont believe in halloween, if i culd dress up I would go as a fashion model..
hii mimo! I am from a country that doesnt celebrate haloween lol! We don´t celebrate Halloween here in Costa Rica! MWAHHAHAHAHHAHAHAAA I LIVE IN AUSTRALIA AUSSIE AUSSIE AUSSIE OI OI OI! but we celerbrated anyway i dressd up as the grim reaper MWAHAHAHAAA and i got tons! of lollies! im going as "chucky" from the movie "child's play" LOL. I was going to ask that myself but i dont think he can say that cause someone could figure out his identityy! They could see a bat walking down the street or something and assume it's him! I am From Australia we had halloween last night it was alot of fun we had a party! I live in Australia, and we dont often celebrate Halloween. Ive never been Trick or Treating in my life, and thats been a while. I think we should celebrate halloween in the ACT!!! i was a hobo it was funny.